February 2019: ‘The Portsmouth Service’ premiered at Portsmouth Cathedral. Commissioned in memory of Trevor Owen, former lay clerk in Portsmouth Cathedral Choir. January 2019: My new string piece ‘Momentum’ has just been recorded by the Manchester Sinfonia. I was thrilled to conduct them in this premiere recording - and to feature on this new CD alongside several esteemed composer friends & colleagues! December 2018: As we all know, many Christmas Carols began as folk tunes or drinking songs in taverns. I’ve always maintained that melody is king in Christmas music. I’ve put together a Spotify playlist of some of my most tuneful carols - I hope you enjoy it! Sneak preview of our first run through below! On iTunes here or on Spotify here. 'Oculi Omnium' performed by Bath Spa University Chamber Choir as part of the 70th Anniversary of the Bath Festival at Bath Abbey. Conducted by Francis Faux. Sheet music (SATB, no divisions) available from Boosey & Hawkes or RSCM Music Direct. New ballet 'Chrysalis' written for English National Ballet 'Dance Journeys' 2018 now on Spotify and iTunes! Premiered at Sadlers' Wells, April 2018. You can here the premiere broadcast from the Three Choirs Festival below. Sheet music available here. Listen to more of Thomas's media music on the music for the moving image page. More of his music can be found on the media page. Performed by John Shaddock, Bass trumpet & Thomas Hewitt Jones, piano. Come join me on Spotify! ...and now YouTube, at https://www.youtube.com/thomashewittjones! January 2017 - a new ballet for English National Ballet's education department. The Star-Spangled Banner rewritten to suit our times. "I'm so sad about how angry some people are, when as the Beatles so rightly put it, All you need is love." You can play it yourself (Piano/Kbd. & any melody instrument) by downloading the sheet music here. 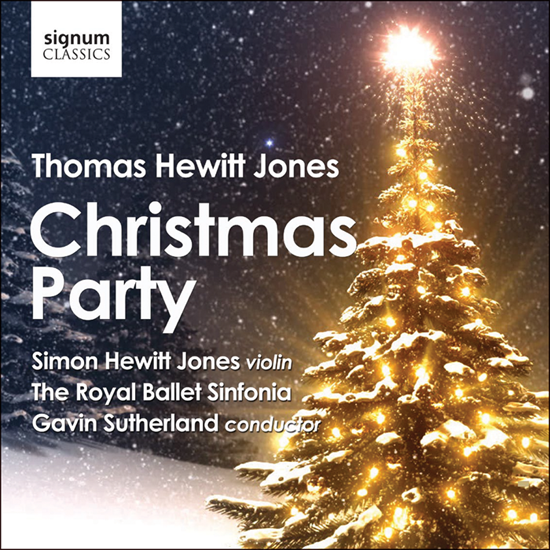 A Christmas Party available on CD here! You can hear many other recent recordings of Thomas's music on iTunes by clicking below. FANTASY ON DAVID CAMERON goes completely worldwide! The performance, attended by over 300 people, took place on Thursday 4 June 2015. This film includes the full work and accompanying sequences showing the details of the sculptures and frieze. ‘Panathenaia’ was composed by Thomas Hewitt Jones with words by Paul Williamson. You can see the full event programme and libretto here. This event and recording was generously supported by Molly Lowell and David Borthwick. To find out more about the performers go here. Take a virtual tour of the Parthenon Gallery on Google Street View here. Site content © Copyright Thomas Hewitt Jones / Metronome Music Ltd. 2003-16. All rights reserved. Find Thomas on Google+ here.